"When someone has died, one of the survivors says, "I'd give anything just to hear him say my name one more time" or "I just want one more day." This is absurd. Nobody wants one more day, one more sentence, or one more anything else. We want all of the days, as many as we can get. We are greedy in our unhappiness. We feel robbed and we want back what we've lost, and then some." Some of the Parts appealed to me right away. I absolutely loved the cover art. Although simple, it relates to the story in the most perfect way. The synopsis promises a deep, heart-wrenching story that will tug at your heart strings. Hannah Barnaby hits all of the right notes. I was drawn in immediately! She delivers a powerful storyline with a strong main character. We are introduced to Tallie and the horrific accident that took her brother right off the bat. Barnaby plunges you into the turmoil of Tallie and her family, trying to pick up the pieces after the death of her brother and their son. Tallie's parents both play a strong part in the novel. As a whole and each on their own. You learn a great deal about her parents and how each of them is dealing with this pain in their own way. It's almost as if Tallie is on the outside looking in. While her parents are trying to move forward and put the accident behind them, Tallie is focused on keeping her brother's memory alive, but is this for the best or will it only make things worse? Tallie was a powerhouse! Although in a great deal of grieving, She was determined to go after what she wanted. She had passion and moxy. Although she was decietful in some of her schemes to get answers, she had good intentions. She just wanted answers. Having said that, I had trouble connecting with Tallie's relationships with Mel and Chase. I understood why she gravitated to each of them: Mel distracted her, while Chase could assist her in her mission. Yet, I found these characters lacking depth. Mel and Tallie are already friends once we begin the novel, but their relationship never really progresses after that. Perhaps that was the point? We meet Chase the same time Tallie does, and although his introduction gives promise, this was another relationship that lacked a little. Although their bond was stronger than Mel and Tallies, in my opinion, I still hoped that we would see more development. They just kind of met, and that was that, they were friends. I longed to learn more about Chase but there wasn't much backdrop focused on him. I also wish their was more back story regarding Nate. Yes, we learn a fair bit about him but I wish we learned more about their relationship together rather than just through the memories Tallie had of him sprinkled in throughout the novel. Having said that, these are just minor complaints and the story redeems itself fully! The author crafted a heart rendering story about a sister's desperation to keep her Brother's spirit alive, and perhaps, ease her guilt. Having a brother myself, this book definitely hits home with me. I could not imagine every going through something Tallie and her family had to face. It truly puts things in perspective and makes you feel grateful for what you have. 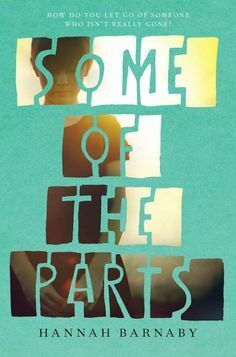 Some of the Parts is a powerful young adult novel that touches on real issues! I cannot wait to read Hannah Barnaby's future work and see what else she has up her sleeve! Nice book. Here is provided nice information to people. Easy writing - more success. Here is about it http://www.elephantjournal.com/2016/02/moving-past-big-failures-emerging-in-victory/ Check it out. Here is also nice related articles!